This October in Orlando, BAI Beacon will be the place for financial services trailblazers who lead, innovate, inspire, learn, teach and cross-collaborate. 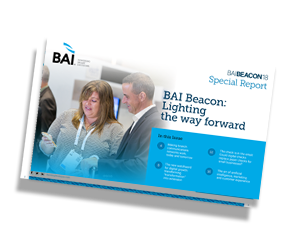 In advance of BAI Beacon, four industry thought leaders offer their views on important industry topics. This report will help you discover and ignite your own beacon, and bring its intensity, brightness and brilliance back to your organization. In the high-tech sprint of the digital age, the question of how to time modernization only allows for one correct answer: Now. Building on digital presence to enrich customer experience isn’t a given. But you can start by rethinking a long haul as short, sensible steps. Checks can be deposited digitally. But many small business owners may not know that they can be sent that way, too—and at a great cost savings. Banking’s biggest sea change in history has arrived—with artificial intelligence and analytics bringing big wins to banks and the customers they serve.